I am a music collector, and when I travel some of my first destination targets are the music shops I can find in various cities: mostly CDs and LPs, but also books about music and other paraphernalia. So it was a really amazing coincidence that when I moved to a city as big as London I should find one such shops, which turned out to be the best of its kind, just a few steps from my apartment. As I walked inside, I was struck by the sight of a huge mass of CDs all over the place, but also LPs and 78rpm discs, and even cylinder recordings! The welcoming owner is Roger Hewland but the shop has been running non-stop, at different London locations, since 1906, when a certain George Russell founded the "Music Exchange" in the Islington market. The shop prospered there until 1922, when it moved to Oxford Street, and from there to Wardour Street in 1956. On Christmas 1978 Gramex was relaunched under its current name at Wardour Street. Roger was running a book shop then, but was in love with music as much or more than with books. When Gramex went bankrupt in 1981 Roger bought the name and started anew in York Road, just next to Waterloo station, where the shop stayed until 1990. He then moved to 84 Lower Marsh and remained there until 1993. The next move took him to number 25 in the same street, where he remained until April 2014, and Gramex is now at 104 Lower Marsh. He has not had a holiday since he opened shop, and greets customers six days a week, 11am to 7pm, every week of the year. He said he will take Saturdays off when he turns 100, in about 18 years' time. 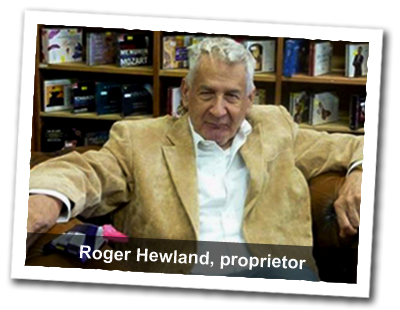 Roger Hewland's ancestors were Huguenots, protestants who fled persecution in France. Huguenots ended up in many places where protestants were accepted. I have met Huguenot descendants as far as South Africa, where they started that country's wine-making tradition. Roger's family crossed over to England in 1712. He has French, Spanish, Italian as well as English blood in his veins. He is a born and bred Londoner, you can certainly tell he is an Englishman from a mile away but he considers himself a member of the European nation. He hated the British Empire but loves the Commonwealth. He believes in the European Union and will vote accordingly when there is a referendum in a few years time. In his shop he accepts Euros as well as pound sterling. "It's anarchy, not chaos" is one of the first things he told me. "Having all my music in random order makes you find what you did not know you wanted and trigger impulsive buying instincts in the collector. It makes perfect business sense." He also does not like shelves. Most items on sale are on tables and even boxes, but always displayed so you can see the cover. "No point showing a record spine, no one likes those, but collectors like covers." After a few months of frequenting the store, and several hundred CDs in my collection later, I agree. Roger is a dealer, but first of all a collector. One has to be a collector before one can be a dealer in music, he says. Still today, he does not tire to repeat that the most important part of his job is not selling records, but buying them, and that is what he enjoys the most. "Good records sell themselves" he says "and customer are my staff: they help themselves to the music." Every day collectors bring in records they want to sell and Roger screens them carefully to pick those fit for sale at Gramex. He certainly is an experienced collector, and so are most of his clients. He bought his first record in 1948, on 20 October 1948 at 10:32am to be precise, a rainy day in London. It was a 78rpm version of the Butterfly. He had £200, spent it all on records, does not regret it a bit, and has not stopped since. He now has over 50,000 opera 78s/LPs/CDs/cassettes/cylinders etc in his personal collection at home. He owns 27 editions of Traviata, all those he could find. Bohème and Trovatore are his favorite operas, though under pressure he would admit Beethoven's Fidelio, my favorite, is the greatest opera ever written. Originally the shop only dealt with classical music, but when, about twenty years ago, he asked his customers whether they wanted to add jazz, 90% said yes. And so it is jazz and classical now. Joe, a jazz musician, helps with the jazz part of the business. When a jazz collection comes in, the invaluable Joe is called to deliver his judgement! Customers also voted against having any music playing in the shop during business hours. So, no Domingo or Callas in the background: now the chatter and banter amongst patrons, as well as the typical London sarcasm at which Roger is a master, are the only sounds that mix with the franctic shuffling of CD cases by avid collectors. However, a headphone is available if you want to listen to a CD before you buy it. It's more a club than a shop, Roger says. Many of his customers have become friends, and I like to think of myself as belonging to this category. When he was in the hospital for an operation a few years ago they kept the shop open for him! People are free to use the toilet and the kitchen, where coffee an tea are complimentary. Good English tea for sure, but coffee left a bit to be desired, so I gifted Gramex with a good Italian Moka machine! One more reason because of which, if you love music, you must visit Gramex when in London.